Killer Characters: Molly Murphy on Love and Marriage. Molly Murphy on Love and Marriage. A wedding day should be the happiest day of a girl’s life, shouldn’t it? Something we’ve dreamed of since we draped old curtains over our heads and paraded up and down clutching a bouquet of dandelions. Well, my wedding day was finally approaching and I was still plagued with uncertainty. I loved Daniel, my police captain sweetheart, that much was sure. And I had nothing against becoming Mrs. Daniel Sullivan, except that it meant giving up my independence. From now on my husband would decide what I should do and say and wear. Everything I had belonged to him. He had the right to beat me with a stick no thicker than his thumb. In short, he wore the pants in the relationship in more ways than one. I knew that Daniel was a moderate man, a sensible man. He would not try to order me around and certainly wouldn’t take a stick to me. But I would no longer be allowed to work. That much had been made clear and had been one reason I’d been so hesitant to say “I do.” You see, I’d been running my own little detective business and as Daniel pointed out, he’d be the laughing stock of the New York Police Force if it was known that his wife was also playing at being a detective. Besides, a working wife meant that her husband couldn’t afford to support her. So reluctantly I’d agreed. Oh, I can’t say I would completely regret giving up my little agency. There had been times when I had been in danger and had longed for a more peaceful life. There had been times when I’d had no cases on the books and had thought I might starve. But I just couldn’t picture myself staying home, giving tea parties and doing nothing more dangerous than embroidery . I’d met other women who had left college with lively minds, only to shrink to what their husband expected of them--nothing more than beautiful adornments—somebody’s wife and somebody’s mother, but no identity of their own. Of course I knew that I was lucky in many ways. I had chosen my husband, which was a luxury not all women in New York City had. Newly arrived immigrant girls had their parents and a matchmaker choose their future husbands. And girls at the other end of the social scale were similarly pressured into marriages based on financial mergers rather than love. So I should be grateful and happy and look forward to my wedding. And if I took on one last case before the big day—well, Daniel didn’t need to know, did he? 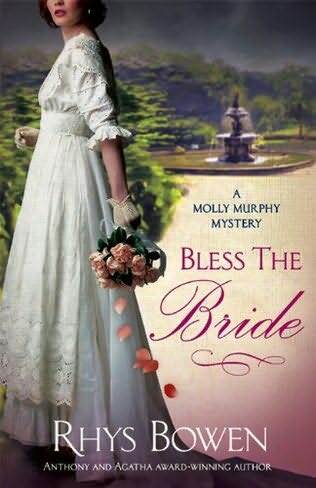 Read about Molly’s last case before she marries in Bless the Bride. It arrived in stores March 1. And in case you’re worrying that Molly’s career is over, Rhys tells us that she is already halfway through the next book. award, including the Edgar for best novel, and she has won nine of them. turn-of-the-century New York City as well as a new, lighter series, this one about a minor royal in 1930s England. The first book was called Her Royal Spyness. It has been described as Bridget Jones meets Charade as told by Nancy Mitford and described in a Booklist starred review as "A smashing romp". Last case, Molly? I hope not! I love a happy ending, Molly. Something tells me you haven't had your last mysterious adventure though! We'll all keep reading to find out. We're glad joined us here at Killer Characters! Molly,just wait until you have a baby or three. Then you'll be grateful for Daniel's steady paycheck and the ability to stay home. Dragging a toddler by the hand and carrying an infant would make it difficult to trail someone inconspicuously. Maybe you could get involved in doing research for a professor or someone? Might lead to things . . .
Molly Murphy give up her independence and submit to Captain Sullivan, not a chance. I look forward to reading how Molly will hang on to her own identity. Three cheers for Ms. Bowen for such a bold move with an established character. I love a daring bride. Especially one whose policeman husband doesn't know that she's out sleuthing. Good for Molly! I like her already. Daring and delicious. What fun to know she'll have another adventure! Love a feisty female and sure hope she'll figure out how to take on some more cases on the QT, if need be. Looking forward to reading this!